Let me start off by saying that NO, I am not the birthday party grinch. If you’ve read any of my posts, or taken a gander at my Pinterest Boards, you’ll know that my default mode is party planner extreme! I take a theme and I run with it – everything from the activities, to the food, to the birthday party decorations, to the goodie bags are all carefully crafted to create an amazing experience. But this year, it wasn’t to be. You see my oldest daughter’s birthday is December 28th, and while she’s never seen it to be a disadvantage, as a parent who is also planning for Sinterklaas (Dec 5), and Christmas, as well as regular life, and work – it can all become a bit much. I was so excited to find an amazing and unique venue for the party. My daughter has been into dance and gymnastics for most of her life, but those themes had been done before. 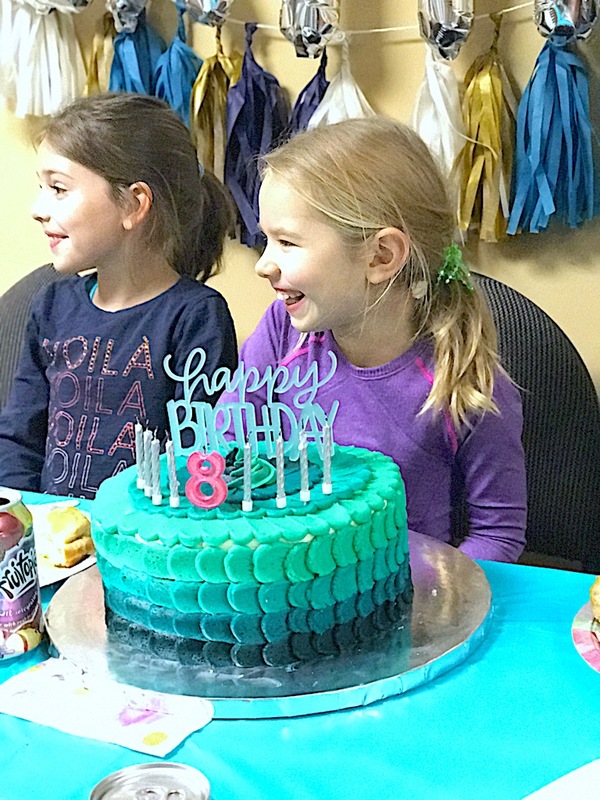 Then I came across Absolute Cheer & Tumbling in North Vancouver, and their birthday party leaders who combine the skills of gymnastics and the choreography of dance with some awesome lifts into a super fun and different Cheerleading party! I was on a roll. Once I had a venue and a theme, then I set about shaping all of the other aspects of the party to fit the theme. But I hit a roadblock. What is the first thing you think of when you hear the word ‘cheerleading’? It’s the pompoms, right? Me too! But in speaking with the owner of Absolute Cheer, I was really inspired by her passion for changing the image of cheerleading. It’s not about the pompoms. In face there is not one in sight! Cheerleading is a sport that requires skill and strength, athletic talent and dedication. I was thrilled with the way they empower girls through cheerleading…… and it also put a stop to my “stereotypical” cheerleading theme. So I had a party without a theme. I’d never done a party without a theme so I was at a total loss. What did I do for the goodie bags? Or the cake? What about the birthday party decorations? I was drifting hopelessly until by chance I reconnected with a mom I knew from my Gymboree days. She and her sister had JUST opened a boutique party & gift shop called Frankie & Co. One step inside their festive doors and I knew that I was in the right hands! After chatting with them and wandering through display after display of modern, whimsical birthday party decorations and supplies, I was so full of ideas that it was hard to narrow them down! When I finally did (with a LOT of help on their part – these ladies know what they’re doing!! ), they took care of everything for me! I think the biggest eye opener for me was the idea that everything doesn’t have to be themed and matchy-matchy to be beautiful and fun. My daughter picked out her favourite plates, and the Frankie & Co. ladies made suggestions for coordinating the napkins, balloons, forks, and even the candy skewers that we put in the loot bags. The best part was that it was SO EASY! Forget pompoms on top of the cake. I made a simple cake with a similar colour scheme and topped it with this gorgeous cake topper! I put down the DIY tassel garland kit and picked up a pre-made one. I gave my self permission to ask for help, and you know what happened? The world didn’t end because I didn’t put the damn tassel garland together myself, or decorate an elaborate cake. Everyone still had an amazingly fun time celebrating the special person that is my daughter, who felt nothing but love and friendship, even if someone else did blow up the balloons. I have to give a HUGE thank you to the incredible ladies at both Frankie & Co. and Absolute Cheer and Tumbling who really did save the day for me and provided an incredible party experience for my daughter and her friends. I can’t recommend them enough!! For anyone planning any sort of party or event, Frankie & Co. is the place you want to go! From their Candy Bar to their upcoming Balloon Bar, they have goody bags and party decor for any occasion. (I’m now DYING to host a gender reveal party for someone thanks to their awesome novelty items) You can order online, and be sure to follow them on Facebook, Instagram and Twitter. Absolute Cheer & Tumbling is a place you want your kids to be! Learn more about their birthday parties, cheer and tumbling programs by checking out their website, and following them on Facebook, Instagram and Pinterest. I really liked all these ideas, Unique and artistically made. Guide for birthday party planning is really amazing. Thanks for sharing! It will really help a lot! Glad to hear that Elly!